Coventry based artist Neil Adcock has grown up with racing motorcycles. His father started racing when Neil was 8 years of age on a 500 cc Velocette and then changed to a 350cc Aermacchi,his dad is still riding at the grand age of 74. Whilst supporting his father at the circuits and in the workshop, Neil, also a chartered engineer, developed a deep interest and understanding of both vintage and modern racing machinery. Consequently when Neil returned to painting after a prolonged break, to bring up a family, the natural subject material for his artwork was motor sport and in particular classic racing motorcycles. Neil aims to bring the black and white images of past racing greats on both 2 and 4 wheels, such as Mike Hailwood, Jaun Manuel Fangio and Barry Sheene to life in full colour, with his own interpretation in oil paint and acrylic. In addition to selling direct to clients he has exhibited work through the Waterside Gallery Stratford upon Avon, the Diesel Gallery, and Loft theatre Leamington Spa, and Abbey Club Kenilworth. 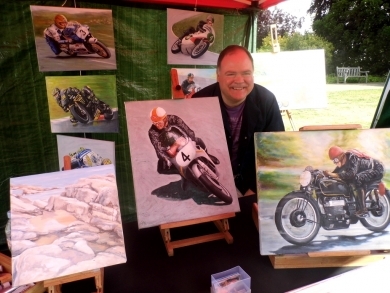 Neil has also had his work published in the Classic Bike Guide and Artspace Magazines and regularly exhibitsand demonstrates at classic motorcycle and car events.